The infinite catalog of streaming music: has it affected our listening habits? Over the past decade, technology has offered the music consumer an opportunity: easy access to the entire recorded output of music. Since 2016, subscription model of music access has passed all other methods of consuming music. Gone are the days when the consumption of music would be influenced by budget, radio presence, playback devices, Internet speeds, or regional access to certain genres. How has the listener’s relationship with music changed due to access to this infinite catalog of streaming music? Does having expeditious access to the world of music broaden the listener’s awareness of music from a variety of genres and cultures? In this post, I will posit that access to the “infinite catalog” has discouraged repeated episodes of deep listening. Since music was first etched onto a wax cylinder or piano roll, there has been a hunger to gain access to this amazing new technology. The thrill of hearing Caruso sing in your living quarters or Brahms actually perform on your own player piano was undeniable. At first, the cost of entry was prohibitive except for the most wealthy Americans. But, after the technological developments during WWI, the new technology began to trickle down to the masses. From the years 1914-1921 phonograph record sales doubled. Close up of a wax cylinder on an Edison machine. Each future generation would have a music media that would become their own. Jazz and swing music in the late 1930s and early 1940 spread on 78 RPM acetone records. The coast-to-coast popularity of rock and roll in the 1950s was due to the distribution of 45s and singles. The full-length albums of the 1960s and 70s saw the creation of artistic statements that required 23 minutes per side to develop. Cassette and Sony Walkman culture made the music libraries of the 1980s portable. The CD of the final decades of the 20th century brought a digital fidelity to the masses offering clean, clear recordings that were durable. Enter MP3. Computer programmers developed a method to shrink the audio content to a small digital file. This was accomplished by removing the data that would most likely fall outside the range of human perception. These small files allowed easy storage on the computers of the late 90s that had tiny hard drives. MP3s also ushered in the ability to send copies of the file online. The first file-sharing services were not the paid subscription models of today. Early programs like Napster, Audiogalaxy, and Limewire allowed users to "share" their own MP3s. At the same time, they downloaded content from others. Since these services did not pay for mechanical rights or any kind of royalties, this model has clear copyright and ethical issues. Yet, it did offer the consumer a taste of what it was like to have access to a huge catalog of content. It helped to pave the way for its progenitors in the new streaming model. Spotify is the name that comes to mind when thinking of the new subscription model and for good reason. Spotify offered a legal alternative to the original file-sharing programs that were plagued with issues of viruses and illegality. As of September 2017, it has been valued at $17 billion dollars and recently went public on the New York Stock Exchange . Other legal streaming services have entered the market (Apple Music, Pandora, Tidal, etc. ), however Spotify was the first to make a big splash this decade. While there were a few companies in the oughts (Rhapsody, Zune) that were early adopters of a legal subscription model, these never caught on. In that time period, a subscription model was foreign to a public that was committed to paying $0.99 for a track in the Itunes catalog. With thirty million individuals paying for one of these services, this new modality of music has become a competitive business. The big players in the streaming game charge approximately $10 a month, but there are some newer services that have tried to break into the market by offering cheaper fees. The price of these premium services can be a barrier for some consumers. In Nielsen’s annual Music 360 Report, 46 percent of those surveyed who do not subscribe to these services cite cost as the primary barrier to entry (Ingham 2016 15). It is an interesting point, since the new model, while inexpensive, may not be bringing the well of music to the masses as is often proposed. With the quantity of music available, it has been argued that it is impossible to consume music on a deeper level that is rewarded by repeated listenings. Critics of the streaming model have pointed to personal anecdotes involving how they interacted with music when hard copies were required. These aficionados recall with fondness staring at album art, reading the liners notes, and memorizing minutiae about the sidemen on individual tracks . When it came to the actual music, possessing a finite number of recordings forced the music fan to give each recording many listens. As a result, the listener would learn the album inside and out. It is not an uncommon phenomenon to find ease when recalling lyrics or singing instrumental solos of an album unheard of for decades. Is this any different than the insipid easy listening radio station of the past? By all accounts, the “rock and roll without the hard edge” radio format become popular in the 1980s and 90s for that reason. Workplaces would be able to tune into one station for the day without the fear of offending anyone. This makes economic sense for both the advertisers and the workplaces. The difference with the "chill" playlist is that Spotify is encouraging shallow listening habits in personal use. Spotify is encouraging consumers to adopt a track-based listening experience as opposed to an album listening experience. While the “single” was a trend in the 1950s, the experience of consuming an album in its entirety is one still etched in the minds of the late baby boomers and generation X. A new record release would involve a conscious ordering of tracks by producers and artists to make a larger musical statement. 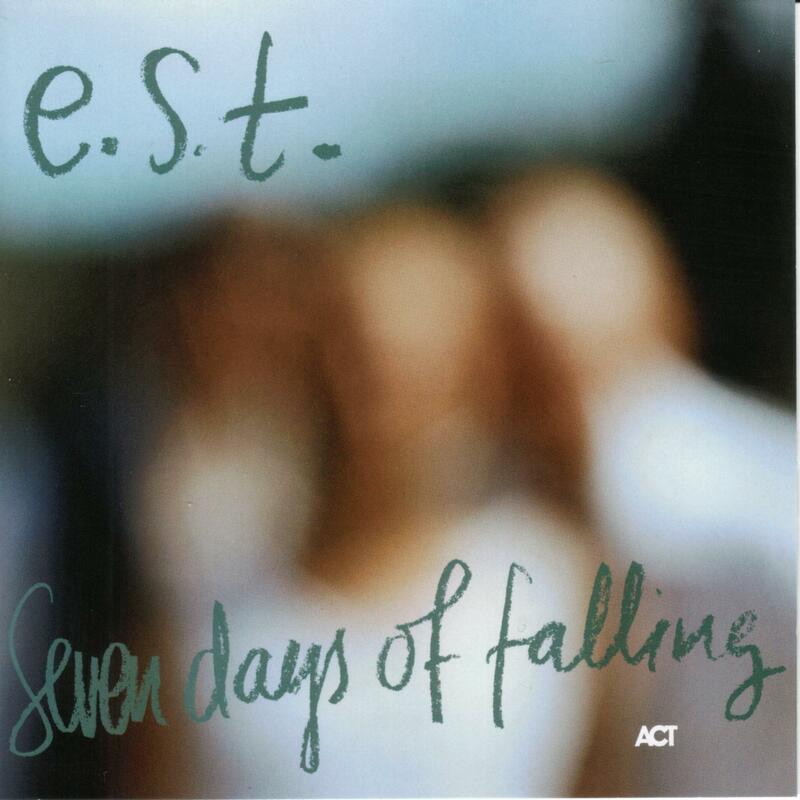 While this still exists in some successful albums today (e.g. Taylor Swift’s “1989”, Kendrick Lamar’s “To Pimp a Butterfly”), it can be quite difficult to pull off in this new medium. The lines that delineate the beginning and end of the album are blurred due to the service’s need to keep the music playing. Reaching the end of an album no longer results in a needle stuck in the inner groove or the gentle whirr of a CD spinning down. In Spotify, the last track of an album now launches an infinite playlist inspired by the previous album. Track based listening is also the result of using a digital application. One of the eternal complaints about consumption of social media is that it results in a lack of attention. The user will peruse the news, their friends’ posts, a shared video, or a meme in an unintentional manner. What they decide to gloss over, and what they may eventually explore in further detail, seems to be at the whims of a short attention span combined with a computer-generated algorithm. This tendency can also be seen in how consumers are encouraged to interact with streaming music interfaces. Listening to any track is accompanied by information in the application encouraging the user to click on another track. It draws your attention to lists of suggested tracks, customized playlists, or tracks your friends are currently listening to. The infinite catalog also inspires the “fear of missing out”. With the application nudging you, there is a strong urge to keep exploring while never being in the moment. In the post-Napster days, I was becoming overwhelmed by the simple (albeit questionably legal) access to music. While exploring the infinite catalog was fascinating, I wasn’t getting deep into these newly discovered albums. I remembered the days having only a few CDs in the mid-1990s in conjunction with my father’s record collection. I played one of my first CDs Bill Evans’ “Portrait of Jazz” so many times I can still sing the solos. I mentioned the following story in my blog before but it fits into the conversation. In the mid-2000s, I was longing for the old days of getting deep into limited albums. My car only had a cassette deck and I was looking for music to play for the drive. A record store was going out of business and was liquidating cassettes for 99 cents. 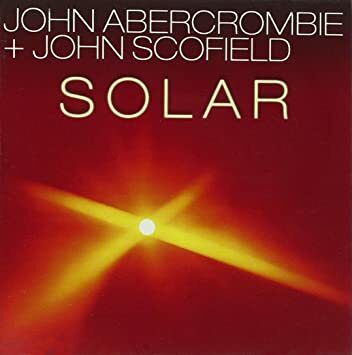 Among the purchases made were Solar by guitarists John Abercrombie and John Scofield and Live at the Village Vanguard by Phil Woods. In a type of limitation exercise, I told myself these would be the only albums I would listen to for a year in my car for the year of 2005. What were the results? To this day, the opening choruses of counterpoint from the title track of Solar are burned into my brain. Even the odd moments have been assimilated. For example, there is one striking dissonant line in Abercrombie’s tune “Small Wonder.” Scofield starts his solo by playing this outside line that resolves in an unusual manner. I assumed that it was just the guitarist trying to correct a mistake. That may be true, but after so many listens I have become to love this line. It is the way the solo should begin! For me, it becomes what the audience expected from Ray Nance, Duke Ellington’s trumpet player. While Nance’s classic solo on “Take the A Train” was first improvised on the recording, he played it the same way each night they performed. Why? Because that is what the audience expected. That was embedded in their minds from the recording. Even when the tune is played by today’s big bands that Trumpet 2 part is often notated. Solar: My listening experiment for one year. It would be amiss to not mention the positive aspects of this democratization of music choice. Nguyen illustrates in a 2013 study that streaming services had no impact on the quantity of physical media sold. This also correlates with an increase in live music attendance. Proponents of this argument present streaming services as a “discovery” tool. Consumers will discover artists from smaller record companies that they would never have encountered in the old media. As a result, the artist not only has their music played but also benefits from ticket and merchandise sales. Still, there has been a surprise, though niche, reaction against the prevalence of the subscription model: a return to physical media. Why are we seeing a rise in new vinyl pressings over the past decade? The cynics say that vinyl is just another fad where it is fashionable to collect records and that these records aren’t receiving much play on the actual turntable. The convenience of digital consumption (e.g. the download code that comes with each new record) trumps the manual experience of arming the tonearm. Contrary to the above, I see the sincerity in the rise of vinyl culture. Vinyl promises the opposite of everything that the subscription model provides. It is not portable. It is finite. To share it means to actually sit down in the same room as a friend and experience the same sound waves. It appears to be acting as a return to conscious, active listening. The long lost experience of liner notes, cover art and most importantly focused active listening is what has been guiding this trend. 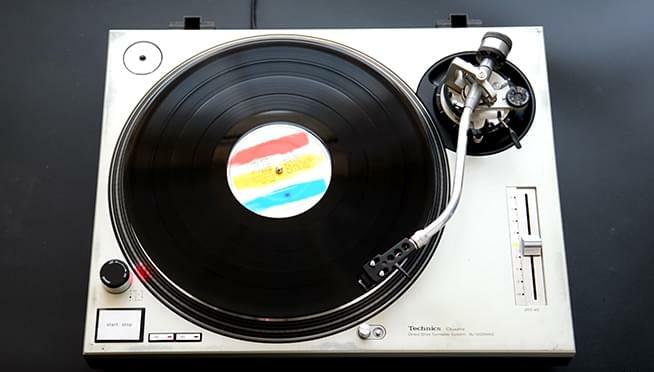 Setting aside the analog versus digital arguments there is an experiential component that is attractive to those who were brought up on listening to non-tactile music. Vinyl: will the resurgence of this format be the savior of our listening habits? 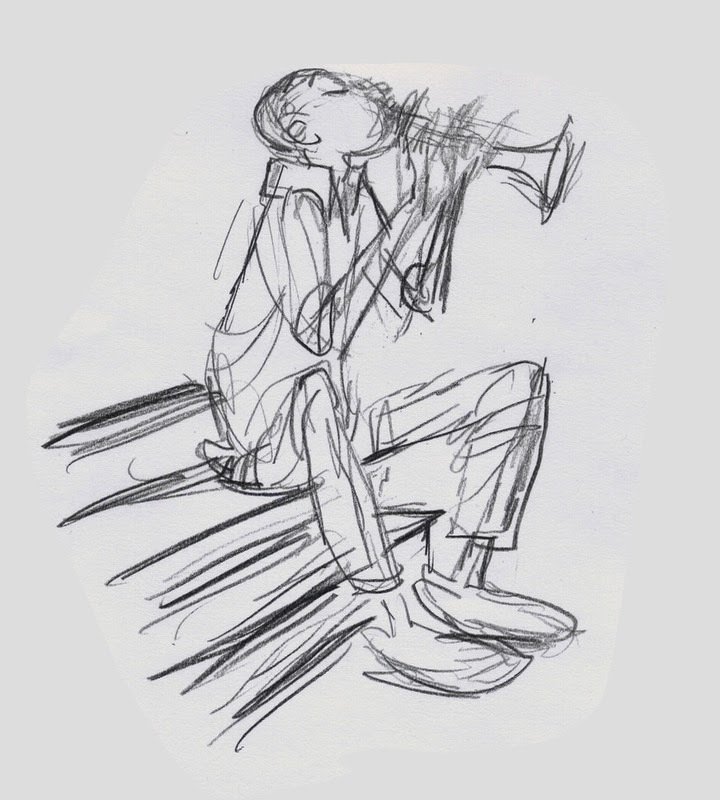 An effective and quite creative method for composing/improvising strong melodies would be to connect it with the visual artist's technique of contour drawing. In contour drawing, the artist looks at the landscape (say mountains and hills on the horizon) and closely inspects the line that is created by the edge of the land where it meets the sky. As they put pencil to paper, they will not draw the mountains or sky, but will simply draw the shape of the line where the two meet. Even by drawing a simple line they will accurately define much of the composition. This type of drawing technique is very common in quickly sketching out an outline of any object just by defining the lines that create the boundaries. By adding more lines they can illustrate the contour in a more detailed fashion. So think about this concept as it relates to melodic motion and contour in music. For musicians, the melodic contour is similar to the line. Does it ascend? Descend? Is there a climax? Is it smooth (conjunct, stepwise motion)? Or is it jagged (by leaps)? Maybe there is a repetition of a sequence of lines (notes) that repeat? 3. Finally, apply this to your voice or instrument. Use this drawing or the lines on any piece of artwork. Record your results and listen back. What do you think? Pretty interesting right? It is sort of like reading a score but more creative since you are forced to add the notes and phrasing. But the melodic shape is set in stone by the drawing. The final step is to consider this concept as you play composed or improvise melodies. Picturing a line in your head as you play will make you sensitive to this musical element. I have always enjoyed the aesthetic of music scores. 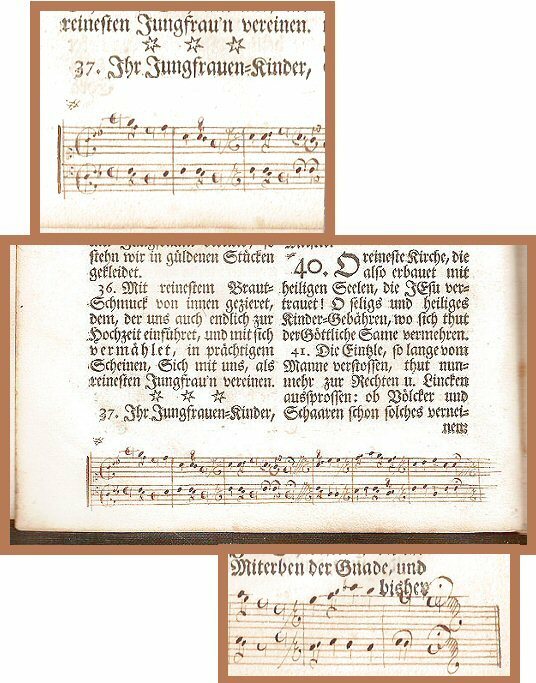 Whether we go back to the earliest notating of neumes to a modern Stockhausen score something about music on paper is exciting to me. Why? Because it is dormant. It is not music in itself. But it represents music that could be. Scores have no meaning unless performed. But how is it to be performed? A good score gives you just enough information to recreate the work the composer had in mind and leaves some freedom for the performer to interpret. Ancient scores are particularly intriguing. For me, the mystery is that we have no clue as to what this music sounded like. The notation system itself is cryptic and undeciphered. Figure 1 below is an ancient Sumerian score that seems completely foreign. The Western notation below it is an attempt to recreate how this music may have been performed in 3400 B.C. Music historians identify the above as the oldest song that has been preserved to this day. It was a hymn for a Sumerian religious cult. 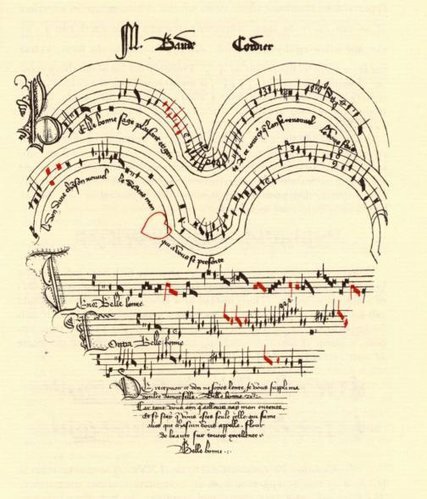 Professor Anne Kilmer has attempted to decipher this music and makes a surprising discovery. Polyphony may have been present in ancient cultures! From the Chicago Tribunem "To a Western ear, the tonal sounds are very familiar. The notes are equivalent to a Western-style major "Do-Re-Mi" scale, which brings into question the theory of such a scale being only as old as the Ancient Greeks of 2000 years ago. 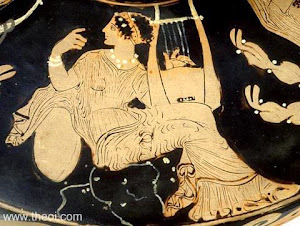 Professor Kilmer’s interpretation of the song, made in 1972, even includes a form of harmony, two or more notes played at the same time, which was previously thought to be non-existent altogether in ancient music." Take a listen to Kilmer's interpretation. The German immigrant Conrad Beissel created a community of celibate religious men and women that made their home in the Ephrata Cloister in Lancaster County, Pennsylvania in the 18th century. They lived a strict ascetic life. They slept for six hours a night which has broken by two hours of wakefulness to watch for the coming of Christ. They were required to sleep on wooden benches with a wood block for a pillow.They ate one small vegetarian meal a day. Despite the tough life, music was one of the pleasures of the community. Musically, it is very interesting to see what this group developed. In 1747, the community printed the Turtle Dove hymn book. In this book, Beissel explains his theories of music composition. In a sense it was the first American music theory textbook. However, his theory was very unique and deviated from common harmony practice at the time. Beissel also developed a unique shape-note system which you can see illustrated below. It is different from the system common in New England in this time period. I actually live only a mile from the cloister. If you are in Lancaster County, I recommend taking the tour. You will be able to see some of these scores in person. They are much larger than these images imply. The text and notation are expertly crafted and the plates are quite beautiful. "Belle, bonne, sage" by Baude Cordier (15th century). "Circular Canon" by Baude Cordier (15th century). In a future post, let's see what some modern composers do with the score. This it where it gets really interesting. In a previous post, I discussed the idea of using gesturing as a creative warm up technique. Gesturing is a technique that visual artists use to quickly capture an image. If you missed that original post you can check it out here. In that post, we discussed using "gestures" to improvise and warm up with melodic lines. You can use the same technique for harmonic instruments. Gesturing with chords can be a really exciting experience. Not only can you warm up and learn to really hear the harmonies you are playing. You can also discover some exciting new progressions that you otherwise might have missed. Any instrument that can play chords can use this technique. Of course your chord vocabulary will determine what you could do with this technique. Having a greater knowledge of harmony will give you more options. But that shouldn't exclude beginning musicians. Even musicians that play primarily melodic instruments should sit at the piano and try this exercise. The process is pretty simple. Close your eyes and play a chord on your instrument. Any chord. Don't think of the name of the chord. Think of only two things: the sound of the chord and how it feels under your fingers. Now with smooth voice leading you will go to your next chord. That chord doesn't have to be far away from the chord you just played. You may only wish to change one or two notes from the previous chord. This will ensure smooth voice leading. Now that you've played your second chord repeat the process and go into your third and fourth chords and so on. As you start this exercise you may wish to use smaller chords to begin with. For example, you can even use simple double stops or triads. Later on you may wish to expand to larger chords or chords with more complicated extensions. Pay careful attention to the top note of each voicing. Even though we're dealing with harmony that top note is actually creating a melody as well. Stay aware of it throughout the process. If as you're gesturing you feel like adding more melodic movement to your soprano line by all means do so. If you have a strong background in harmony this can be both a blessing and a curse in this process. You have a great vocabulary at your disposal and have a good sense of harmonic direction. But you also know all the rules of Western harmony and how it has developed over the years. If you perform a roman numeral analysis while gesturing, it will defeat the point of the exercise. Just like we did with melody avoid the temptation to create a masterpiece. The point of gesturing is to just experiment with sound; in this case harmony. It is meant to be a very "right brain" activity and the more we can just focus on the sound the better. In the end, the sound will most likely follow some sort of harmonic rules and structure. Just don't let your knowledge of theory close your ears. One thing you can do with this process is to record yourself. While I said the goal was not to create a masterpiece, you may find when listening back to your recordings that there may be a little nugget of musical gold in your gesture improvisations. As you listen back to yourself, if there is one or two moments that stand out as memorable, then figure out what you played. Transcribe it. Notate the chord progression and soprano line you created. Now use your knowledge of music theory to figure out why this works. If you like it enough you may want to flesh it out into a fully formed composition . You don't have to record this process. Just like with melodies, gesturing with harmonies can be a great warm up tool. It gets the fingers moving. It gets your ears focused. And gets you ready for your creative work. In the example below I demonstrate how I go about gesturing with chords. 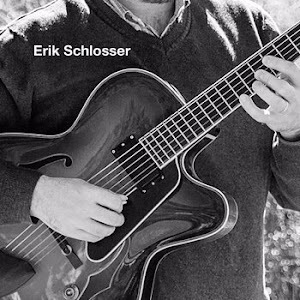 Now since I'm well versed in jazz harmony, my playing definitely uses a lot of chords more common in jazz playing. However you can use this process with simple triads . And once again if you play a melodic instrument, I encourage you to sit the piano and give this a shot. The nearly three month hiatus from the blog has inspired this post. We all have them. That period of time where we are constantly moving. Work, family, and other obligations seem to absorb a sequence of days, weeks or even months. Any creative projects you had planned are put off for a future date. As a music teacher, April/May always seems to be that time. Right around the end of May, performances finally slow down. I begin to see the light at the end of the tunnel. Excitement about future projects begins to creep in. But until then, my responsibilities keep me from exploring my own creative work. Prior to this busy season, I started a new habit that lasted a few weeks (yes I know it is not really a "habit" then!) I knew I would be hitting a barren season where it would be hard to find time to work on a project. I needed to find a time in the day that was just mine. Time that couldn't be eaten up by school or family obligations. So I started to wake up two hours earlier. The morning seemed to be the perfect time. No one was up to disturb me. I was fresh and alert. And I got a lot done. Those two hours seemed surprisingly long. As a bonus, when I started my teaching day I felt accomplished. I had already spent a good chunk of time working on my personal creative projects. As mentioned above, this lasted for only a few weeks. Once I started getting home from evening obligations later and later, it became hard to set that alarm. Probably, rightfully so since sleep and rest is a prerequisite for creative work. But I know that is not the way to do it. You just need to start writing, playing, practicing. Time to get back into things! I think I need to revisit my previous advice! In part 1, I discussed the importance of focusing your listening time on just one album or musical work. Thoroughly absorbing one work through repeated active listening can be a rich experience. We also discussed the dilemma of today's world of accessible music. By having so much music available to us, we have a tendency just to skim the surface of our music collection. The challenge? Pick one album or work and thoroughly absorb it. Schedule active listening sessions where you are devoted to exploring the record. Listen to it whenever you have a moment. Isolate individual tracks and spend time analyzing them. Make the recording a part of your musical identity. Unfortunately, I discovered this Swedish piano trio only in the last few years. The leader, Svensson died in a tragic diving accident in 2008 thus ending their musical output. This was a great loss to the music world as they were finding their own voice in the "jazz" tradition. They leave us with about 10 albums. I had no chance of seeing them live. However, the albums remain. There they explore the boundaries of the piano trio tradition by incorporating the lyricism of classic trios (Bill Evans) with adventurous explorations influenced by diverse sources (Bartok to Radiohead). Before this project, I listened to the above album in a scattered fashion. Maybe I heard it twice? The listening was sporadic. A track here. Part of the album there. Maybe once, I actually sat down and focused on a larger chunk of it. And this is an album I was really excited about! Now, I have scheduled about 5 active listening sessions where I went straight through the album as outlined in the previous post. When I say scheduled, I actually mean that. With everything going on in life that is scheduled (family, teaching, rehearsals, personal practice), I knew that this listening time wouldn't just fall out of the sky. I picked one hour each week to sit and just listen. Sometimes it was by waking up early. Sometimes it was in the evening or weekends. But for me it had to be a dedicated time. This is a rich experience. Each repeated listening was more exciting, revealing new elements. I highly recommend this "limitation" activity. If you haven't done it, stop and look through your collection and pick something you have been meaning to explore and schedule some time to dive into it. But in this post I want to discuss the benefits of what I lamented about in part 1: the availability of LOTS of music. Can this be a good thing? Can we expand our listening to a variety of artists/genres in a conscientious/intelligent fashion? Can we explore outside of our listening "comfort" zone? We all have a comfort zone. In general, we enjoy experiencing things that we are familiar with. When we consuming a piece of art, we want it to fit neatly in some sort of box. We love to label and classify things in genres. Or identify them as "good" or "bad". Or "my music" and "not my music". There was a Genesis song from the 70s with the paradoxical chorus "I Know What I Like (And I Like What I Know)" which describes this phenomenon to a T.
Each one of the above can be shattered into a million pieces. There are countless artists, masterworks, live footage, scores, or each of the above that we can explore. And once again, it is all mostly available in a few clicks. Still overwhelming, right? Nonetheless, it is out there and the most creative music that is being produced is drawing from diverse influences. The jazz tradition is a great example of this. For awhile in the 70s, the word "fusion" meant only combining elements of "rock" with "jazz". Now, artists are fusing the jazz tradition with many diverse styles in interesting ways. Jazz with country music (Bill Frisell). Jazz with hip hop/R&B (Robert Glasper). Jazz with progressive rock (The Bad Plus). It can be subtle or overt, but contemporary musicians need to come to grips with ways to develop the language. And for any art form that has already largely been defined, the next step is to draw upon diverse influences. My challenge: pick one genre/style/artist/region of the world whose music you are not familiar with. You can step outside your comfort zone a little bit! Spend some time exploring what makes this music tick. Explore the history, development and current state of the art form. Don't immediately discount something because it is unfamiliar. Although, if you are having trouble getting into it, go to a different area. You can't force yourself to "like" something. However, maybe you will come back to it later and find something valuable in it. Once you find something appealing, spend some time with it. Avoid the temptation to explore ALL that is out there. That won't happen. So once you have discovered something new, try to schedule an active listening session that we discuss in Part 1. The more you know, the more you will "like what you know". There have been many accounts of this great saxophonist's singular purpose and drive. Those who observed him practicing have said it is unlike anything they have every seen. I remember Denis Diblasio sharing a story about Coltrane's extended sessions blowing in the mechanical room of a venue he was performing in. Despite the gig every night, he was still exploring up to 12 hours at a time. It was a wild sight. Anyone who saw Coltrane or listened to his recordings from the late 1950s to 1960s knows that this man was reaching for something. And he had the focus and attention to someday grab it. 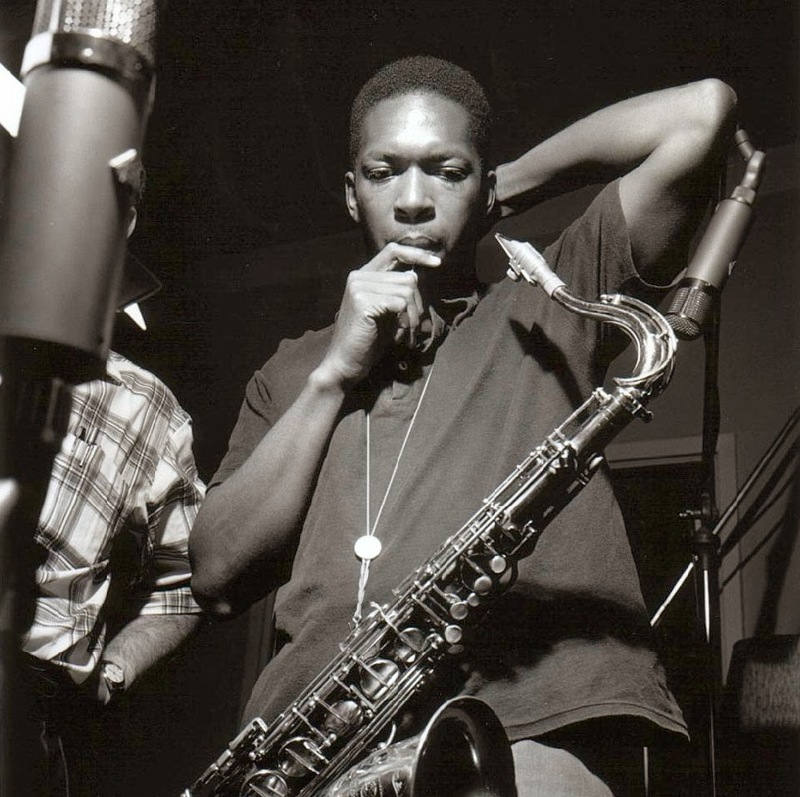 Now Coltrane, like many jazz musicians of that era, struggled with drug use in his past (particularly heroin). Interestingly, once he kicked the habit, he entered his most exciting, creative period of his career. He was exploring new harmonic progressions (Giant Steps, 1960). He was extending the modal vocabulary defined by Miles and Shorter (My Favorite Things, 1961). And he was reaching to experience the free-est of the "free" jazz (Ascension, 1966). All while sober. How was he able to focus this intensely? How did he keep his mind from wandering? How did he keep himself from being interrupted in the middle of the creative explorations? Was he ever distracted to just go watch some TV? These are questions many people ask about Coltrane's practice ethic. Coltrane attributed his work to forces beyond himself. He was a very spiritual person (he carried with him a variety of religious texts) and said his music came from a higher power. I think Coltrane tapped into that same power that Mihály Csíkszentmihályi describes as "flow". In positive psychology, flow is "mental state of operation in which a person performing an activity is fully immersed in a feeling of energized focus, full involvement, and enjoyment in the process of the activity". That seems to describe Coltrane to a T.
In a private interview, John Coltrane spoke of a higher power. He felt that there were forces beyond himself that were driving his music to higher planes of consciousness. He certainly was on to something because he developed in a way that has never been seen before or since. This, however, never stopped him from practicing and developing his skills to the utmost. Jimmy Heath called him the greatest "practicer" that ever lived and, indeed, I witnessed him with his Quartet in the 'sixties where he would solo at great length and then go into the dressing room and keep playing while McCoy Tyner and the others soloed. This phenomenon was observed by many and led to a kind of blind imitation of both his style and approach. It is not possible to duplicate the spirituality that drove John Coltrane. It certainly is possible to be inspired by the man and his music and many were. But the important thing is for every artist to follow their own muse. Music is many things to many people. It can be a philosophy, a style, a way of life. Music, like all art, is never merely technical. So what can we learn from Trane and adopt into our own creative practice? After all, most of us will not ever be able to devote the length of time to our craft as described in the above encounters with Coltrane. However, I think we can all strive to emulate that intensity in the time we do have. If you have half an hour for a creative project, milk that 30 minutes for all it is worth. Instead of only giving part of your attention, try to focus on your output with the same simmering intensity that you see when Coltrane plays. I leave with you a video from 1963 of Coltrane's "Alabama". It is a haunting ballad written a mere few days after a church bombing enacted by a chapter of the Klan killed four children in Birmingham. While Coltrane is not playing as fast and frenetic as he does in his more exuberant explorations, I think this clip illustrates his focus and intensity in a unique way. Just watch his presence throughout the clip. Many describe his reverence in playing as a musical prayer. To me, it is the perfect portrait of man in the deepest state of concentration and flow. Review: Victor Wooten's "Groove Workshop"
Once in a while I would like to showcase books/videos/podcasts that I have found inspirational and useful. 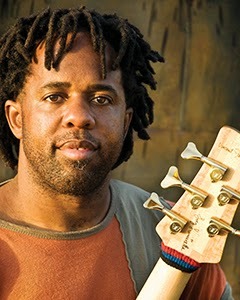 Today, let's check out a DVD by the bassist Victor Wooten. A few years ago, I read Victor Wooten's "The Music Lesson: A Spiritual Search for Growth Through Music". It is a book filled with some stellar musical concepts. However, I think some people have trouble getting into this book for two reasons. One is the phrase "spiritual search". Depending on your cosmological perspective, this could be either welcoming or off-putting. The second is more of a barrier. It is presented in a fiction format. It stars a guru like figure named Michael who imparts his musical wisdom in almost a Carlos Castaneda fashion. Although I found the musical ideas great, I often wished it was more of a proper non-fiction book. But I give Victor credit in finding a creative way to publish a method book. Wooten's "Groove Workshop" cuts to the chase and features Victor running a clinic with his band mate Anthony Wellington (it's funny when a bass player needs a bass player in his band!). In the video, Wooten imparts the same wisdom from "The Music Lesson" but in a more practical hands on way with a small class of bass students. What elements do we normally focus on in our practice? What elements are we ignoring? Now, he asks the group an important question. Which of these elements do you focus on? Which are you practicing? Which element have you been taught the most in music lessons/classes? Number one. Notes. That is the overwhelming answer. Victor's premise is that it is easy to think and talk about notes. Keep in mind the notes category includes: pitches, chords, intervals, progressions, scales, modes. All of these involve "notes". Now more mature musicians will recognize how all of the above are equally important. And a good music educator will teach ALL of these elements (And they do so even if they don't use the word "groove". Well played Bach has a "groove"!). But since the other nine elements tend to be a little more "abstract" they can be overlooked in favor of teaching the more logical side to "notes" (harmony, scales, etc.) Wooten has us explore ALL of these elements. In each chapter, Wooten explores these other elements in depth. He gives some very creative exercises to isolate and explore these elements. Once, again any musician would benefit. As an aside, I am very impressed with Wooten as a teacher. Music educators need to check this video out just to observe his enthusiasm and mannerisms. He has a class of bass players of varying ability levels who he has never met before. Yet he has an impressive ability to coax musical results from each students regardless of their level. His positive nature is infectious. You can't help but just feel good listening to this man talk about music. Here is the official preview video. It is sort of a good introduction, but it focuses a bit on Victor's chops (which are top-notch of course). There is a lot more to the 5 hour DVD that would appeal to every musician. Where does creativity come from? The ancient Greeks adopted the archetype of the "muse" to explain the phenomenon. The muse was a goddess who would govern the creation of the arts. Today, neuroscientists are discovering that creativity is a unique intelligence in itself that can be developed with practice. This is the modern musical muse. I'm a music educator and guitarist. In this blog, I explore techniques to enhance musical awareness and creativity.